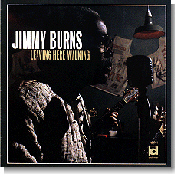 Jimmy Burns came out of nowhere in 1996 to release his first Delmark CD, Leaving Here Walking. It won rave reviews and took home the National Association of Independent Record Distributors’ Blues Album of the Year award that year. Burns, the brother of Detroit bluesman Eddie Burns, recorded with the vocal group The Medallionaires, cut a few R&B/soul singles under his own name in the 1960’s and early 70’s for various labels, but settled down and concentrated on domestic life for a number of years. He never stopped performing, however, and decided, in the 80s to get serious about the blues. For years, he balanced a day job, a West Side Barbecue joint (Uncle Mickey’s) and family obligations, with sitting in with various bands at various clubs around Chicago. In 1995, Delmark head honcho Bob Koester, after hearing one of Burns’ sets, made a deal to record the band. The result was this excellent CD. Burns has the total package as a blues entertainer. He’s a warm, clear vocalist, similar to Robert Cray at times, with just an edge of grit in his vocals. His fretwork is very tasteful. He never overplays and it gives his work a smooth, laid-back style that is pretty much his own. He is also a gifted songwriter, penning five of the 14 tunes including the great title track, which is worth the price of the CD alone. There are several covers of familiar tunes including Mercy Dee Walton’s “One Room Country Shack,” “Rollin’ and Tumblin’,” “Catfish Blues,” and a solo reading of “Gypsy Woman.” But Burns brings something new and distinct to all of them. Burns was playing with the backing band Rockin’ Johnny (Burgin) and the Lazy Boys at the time, and it’s obvious that they know each other well. This CD was recorded the old fashioned way --- the band was in the same room at the same time and recorded several cuts of each song, choosing the best one to be released. Burns went on to record Night Time Again in 1999, a great CD which really displayed his versatility with its mix of blues, R&B, and soul, but sometimes suffered from going in too many directions. Leaving Here Walking comes off as a more focused effort, focusing on nothing but the blues. Hopefully, Jimmy Burns will continue to make CDs as engaging as his first two efforts.